For Women Living with MS Self Care isn’t just a buzz word. I am so proud to be featured in this amazing article all about the importance of wellness and exercise for MS. It continues to be my goal in life to inspire people to achieve their definition of healthy, and lead a life they feel good about. Thank you the national post for sharing a small piece of my story. There’s a good chance Jessica Faulds started her day today by throwing a few swings at a punching bag. She most likely refueled after her visit to her local boxing studio with her favourite breakfast of garlic avocado toast topped with an egg cooked over easy. And after clocking a full day at work, Faulds, 26, may go for a run as she trains for her next half marathon. Taking her dog, Nutella, for a walk will be in the cards, too. It’s a lot to pack into a day, but Faulds, who was diagnosed with multiple sclerosis (MS) at 15, is unyielding in her dedication to her “very strict schedule” of taking care of herself. Sometimes that includes osteopathy and physiotherapy appointments. 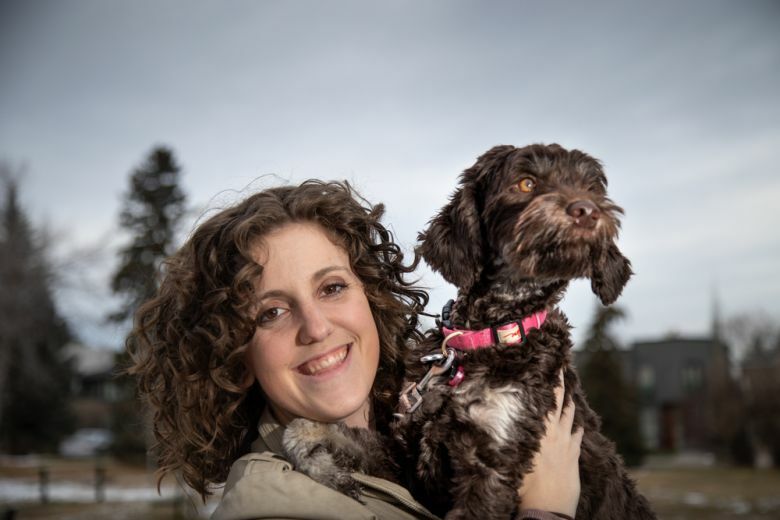 The moment the Calgary resident lets her healthy habits slide, she falters physically and the symptoms of her disease, which can range from numbness and fatigue to chronic pain, worsen. “I physically feel a difference. I can feel numbness in my hands,” Faulds said. “It took me a long time to get to this point, though.” Three times as many women than men are diagnosed with MS, a chronic, often disabling disease of the central nervous system. Relapsing-remitting MS, the type that Faulds was diagnosed with, is characterized by unpredictable but clearly defined flare-ups or attacks in which new symptoms appear or existing ones worsen. Canada also has one of the highest rates of MS in the world with 11 Canadians diagnosed each day with the disease. As for its prevalence in women, scientists believe that hormones may play a role in susceptibility to MS. Diagnosis typically happens between the ages of 15 and 40. While Faulds sought medical attention the moment she noticed something was wrong as a teen, many women tend to ignore the signs that something isn’t right with their health. Experts say it’s because they’re often busy as caregivers and household managers, so they may be more likely to dismiss the fatigue, depression, and dizziness that can signal MS for something else. Recognizing the link between MS and women, a new partnership was recently announced between the MS Society of Canada and Shoppers Drug Mart. Their commitment to women’s health, called SHOPPERS LOVE. YOU., works to compel Canadian women to make self-care a priority. “Generally, women take care of others prior to, or even to the detriment of, their own health. That’s why women’s health is the focus of SHOPPERS LOVE. YOU. We want to showcase women’s health as something worthy of her attention,” said Lisa Gibbs, director of community investment, Shoppers Drug Mart. The partnership will include a shared micro-site on both the Shoppers Drug Mart and MS Society of Canada websites, videos, blog posts by women diagnosed with MS sharing their stories of wellness, and other information about MS and its effects on women’s health, all of which emphasize the importance of self-care. Faulds, who studied applied health sciences and nutrition in university, has her self-care routine down to a fine art. She also inspires other people with MS through her Instagram feed and Facebook forums to devote more attention to their health. Sometimes all it takes is a small change, noted Dr. Charity Evans, a University of Saskatchewan researcher. Dr. Evans recently studied the benefits to MS patients of participating in 50 minutes of Pilates twice a week. She found participants’ walking performance and functional ability improved after 12 weeks, making a simple exercise schedule a viable self-care option to manage the disease. Better still, Dr. Evans noted, Pilates can be tailored to individual needs and abilities. That’s ultimately what self-care is about, Faulds said. It’s finding something that works for the individual and running with it. Shoppers Drug Mart is a proud partner of the MS Society of Canada through SHOPPERS LOVE.YOU. – Putting Women’s Health First – is dedicated to being part of every woman’s support network through the sponsorship of a full range of national and community initiatives focused on advancing Women’s Health in body, mind and spirit.